This invention pertains to a siloxane resin composition comprising R1SiO3/2 siloxane units R2SiO3/2 siloxane units and (R3O)bSiO(4-b)/2 siloxane units wherein R1 is an alkyl group having 1 to 5 carbons, hydrogen, or mixtures thereof; R2 is a monovalent organic group having 6 to 30 carbons; R3 is a branched alkyl group having 3 to 30 carbons, b is from 1 to 3; and the siloxane resin contains from 2.5 to 85 mole percent R1SiO3/2 units, 2.5 to 50 mole percent R2SiO3/2 units and 5 to 95 mole percent (R3O)bSiO(4-b)/2 units. The siloxane resin is useful to make insoluble porous resin and insoluble porous resin and insoluble porous coatings. Heating a substrate coated with the siloxane resin at a sufficient temperature effects removal of the R?2 and R3¿O groups to form an insoluble insoluble porous coating having a porosity of 1 to 60 volume percent and a dielectric constant in the range of 1.5 to 3.0. FIELD OF THE INVENTION  This invention pertains to a siloxane resin composition comprising R.1 Siθ3/2 siloxane units, R2siO3/2 siloxane units and (R^O^SiO (A-b)/2 siloxane units wherein R is independently selected from the group consisting of alkyl having 1 to 5 carbon atoms, hydrogen, and mixtures thereof; R^ is independently selected from the group consisting of monovalent organic groups having 6 to 30 carbon atoms and monovalent substituted organic groups having 6 to 30 carbon atoms; R^ is independently selected from the group consisting of branched alkyl groups having 3 to 30 carbon atoms and branched substituted alkyl groups having 3 to 30 carbon atoms, and b is from 1 to 3. This invention further pertains to insoluble porous resins and insoluble porous coatings produced from the siloxane resin composition. BACKGROUND OF THE INVENTION  Semiconductor devices often have one or more arrays of patterned interconnect levels that serve to electrically couple the individual circuit elements forming an integrated circuit (IC). The interconnect levels are typically separated by an insulating or dielectric coating. Previously, a silicon oxide coating formed using chemical vapor deposition (CVD) or plasma enhanced techniques (PECVD) was the most commonly used material for such dielectric coatings. However, as the size of circuit elements and the spaces between such elements decreases, the relatively high dielectric constant of such silicon oxide coatings (i.e. about 4) is inadequate to provide adequate electrical insulation. In order to provide a lower dielectric constant than that of silicon oxide, dielectric coatings formed from siloxane-based resins have found use. An example of such coatings are those formed from hydrogen silsesquioxane resins as described for example in Collins et al., U.S. Patent No. 3,615,272 and Haluska et al. U.S. Patent No. 4,756,977. While such coatings provide lower dielectric constants than CVD or PECVD silicon oxide coatings and also provide other benefits such as enhanced gap filling and surface planarization, typically the dielectric constants of such coatings are limited to approximately 3 or greater. It is well known that the dielectric constant of insulating coatings is an important factor where IC's with low power consumption, cross talk, and signal delay are required. As IC dimensions continue to shrink, this factor increases in importance. As a result, siloxane based resin materials and methods for making such materials that can provide electrically insulating coatings with dielectric constants below 3 are desirable. In addition it is desirable to have siloxane-based resins and methods for making such resins that provide coatings which have a high resistance to cracking. Also, it is desirable for such siloxane-based resins to provide coatings by standard processing techniques such as spin coating. It is known that the dielectric constant of solid coatings decrease with a decrease in density of the coating material. A porous coating typically has a lower density than a corresponding solid coating. Haluska, U.S. Patent No. 5,446,088 describes a method of co-hydrolyzing silanes of the formulas HSi(OR)3 and Si(OR)4 to form co-hydrolysates useful in the formation of coatings. The R group is an organic group containing 1-20 carbon atoms, which when bonded to silicon through the oxygen atom, forms a hydrolyzable substituent. Especially preferred hydrolyzable groups are methoxy and ethoxy. The hydrolysis with water is carried out in an acidified oxygen containing polar solvent. The co-hydrolyzates in a solvent are applied to a substrate, the solvent evaporated and the coating heated to 50 to 1000°C to ι convert the coating to silica. Haluska does not disclose silanes having branched alkoxy groups. Chung et al., U.S. Patent No. 6,231 ,989 describe a method for forming a porous coating from hydrogen silsesquioxane resins. A porous network is formed by depositing a coating on a substrate with a solution comprising a hydrogen silsesquioxane resin and a solvent in a manner in which at least 5 volume % of the solvent remains in the coating after deposition. The coating is then exposed to an environment comprising a basic catalyst and water; the solvent is evaporated from the coating to form a porous network with a dielectric constant in the range of 1.5 to 2.4. Smith et al., WO 98/49721, describe a process for forming a nanoporous dielectric coating on a substrate. The process comprises the steps of blending an alkoxysilane with a solvent composition and optional water; depositing the mixture onto a substrate while evaporating at least a portion of the solvent; placing the substrate in a sealed chamber and evacuating the chamber to a pressure below atmospheric pressure; exposing the substrate to water vapor at a pressure below atmospheric pressure and then exposing the substrate to base vapor. Mikoshiba et al., U.S.'Patent 6,022,814, describe a process for forming silicon oxide films on a substrate from hydrogen or methyl siloxane-based resins having organic substituents that are removed at a temperature ranging from 250°C to the glass transition point of the resin. Silicon oxide film properties reported include a density of 0.8 to 1.4 g/cm^, an average pore diameter of 1 to 3 nm, a surface area of 600 to 1,500 m^/g and a dielectric constant in the range of 2.0 to 3.0. The useful organic substituents that can be oxidized at a temperature of 250°C or higher that were disclosed include substituted and unsubstituted alkyl or alkoxy groups exemplified by 3,3,3-triflouropropyl, β-phenethyl group, t-butyl group, 2-cyanoethyl group, benzyl group, and vinyl group. (trisiloxysilyl) units were spin-coated on to a substrate and heated at 250°C to provide rigid siloxane matrices. The coatings were then heated at 450°C to 500°C to remove thermally labile groups and holes were left corresponding to the size of the substituents, having a dielectric constant of about 2.3. Trifluoropropyl, cyanoethyl, phenylethyl, and propyl groups were investigated as the thermally labile substituents. Ito et al., Japanese Laid-Open Patent (HEI) 5-333553, describe preparation of a siloxane resin containing alkoxy and silanol functionality by the hydrolysis of diacetoxydi(tertiarybutoxy)silane in the presence of a proton acceptor. The resin is radiation cured in the presence of a photo acid with subsequent thermal processing to form an Siθ2 like coating and can be used as a photo resist material for IC fabrication. R2Si(X)dO(3_d /2); and Si(X)d (OR )f 0(4-d-f/2)l in which R1, R2, and R3 are defined above; each X is independently a hydrolyzable group or a hydroxy group, and d and f are from 1 to 2. The hydrolyzable group is an organic group attached to a silicon atom through an oxygen atom (Si-OR) forming a silicon bonded alkoxy group or a silicon bonded acyloxy group. R is exemplified by, but not limited to, linear alkyl groups having 1 to 6 carbon atoms 'such as methyl, ethyl, propyl, butyl, pentyl, or hexyl and acyl groups having 1 to 6 carbon atoms such as formyl, acetyl, propionyl, butyryl, valeryl or hexanoyl. The siloxane resin may also contain less than about 10 mole percent Siθ4/2 units. The siloxane resins have a weight average molecular weight in a range of 400 to 160,000 and preferably in a range of 5,000 to 100,000. R! can be a linear alkyl group having 1 to 5 carbon atoms, hydrogen and mixtures thereof. The alkyl group is exemplified by, but not limited to, methyl, ethyl, propyl, butyl, and pentyl. It is preferred that R is methyl, hydrogen or mixtures thereof. R2 can be a substituted or unsubstituted linear, branched or cyclic monovalent organic group having 6 to 30 carbon atoms. The substituted organic group can be substituted with substituents in place of a carbon bonded hydrogen atom (C-H). Substituted R2 groups are exemplified by, but not limited to, halogen such as chlorine or fluorine, ether, poly(oxyalkylene) groups described by formula CH3O(CH2)mO)p(CH2)q- where m, p and q are positive integers and preferably a positive integer of 1 to 9, alkoxy, acyloxy, acyl, alkoxycarbonyl and trialkylsiloxy groups. Examples of R2 include, but are not limited to, hexyl, heptyl, octyl, nonyl, decyl, dodecyl, hexadecyl, triisobutyl, tetraisobutyl, trimethylsiloxyhexadecyl, octadecyl, CH3(CH2)i ιOCH2CH2-, CH3O(CH2CH2O)7_9(CH2)3-, (CH3)3CCH2(CH3)2C(CH3)3CCH2CHCH2-, CF3(CF2)5CH2CH2-, phenylethyl, p- methylphenylethyl, p-methoxyphenylethyl, and p-bromophenyl ethyl. R2 is preferably a substituted or unsubstituted alkyl group having 10 to 20 carbon atoms. -(CH2)aC(O)(CH2)DCH3, where a>0 and b>0. Unsubstituted R3 groups are exemplified by, but not limited to, isopropyl, isobutyl, sec-butyl, tert-butyl, isopentyl, neopentyl, tert-pentyl, 2-methylbutyl, 2-methylpentyl, 2-methylhexyl, 2-ethylbutyl, 2-ethylpentyl, 2-ethylhexyl, etc. Preferably R3 is a tertiary alkyl having 4 to 18 carbon atoms and more preferably R3 is t-butyl. (d) water, for a time and temperature sufficient to effect the formation of the siloxane resin. Silane (a) is a silane or a mixture of silanes of the formula R! S1X3, where each R is independently selected from the group consisting of alkyl having 1 to 5 carbon atoms described above, hydrogen and mixtures thereof. It is preferred that R! is methyl, hydrogen or mixtures thereof. X is a hydrolyzable group or a hydroxy group. By "hydrolyzable group" it is meant that greater than 80 mole percent of X reacts with water (hydrolyzes) under the conditions of the reaction to effect formation of the siloxane resin. The hydroxy group is a condensable group in which at least 70 mole percent reacts with another X group bonded to a different silicon atom to condense and form a siloxane bond (Si-O-Si). The hydrolyzable group is a halide group such as chloride, an amino group, or an organic group attached to a silicon atom through an oxygen atom (Si-OR) forming a silicon bonded alkoxy group or a silicon bonded acyloxy group. When X is an amino group, it is generally limited to compositions where R is alkyl or contains less than 10 mole percent hydrogen, since amino may be detrimental to the stability of hydrogen containing siloxane resins. Also, when X is amino, it is typically used at less than about 30 mole percent because the resulting siloxane resin may contain greater than 30 mole percent SiOH. R is exemplified by, but not limited to, linear alkyl groups having 1 to 6 carbon atoms such as methyl, ethyl, propyl, butyl, pentyl, or hexyl and acyl groups having 1 to 6 carbon atoms such as formyl, acetyl, propionyl, butyryl, valeryl or hexanoyl. It is preferred that silane (a) be trichlorosilane, methyltrichlorsilane, trimethoxysilane, triethoxysilane, methyltrimethoxysilane or methyltriethoxysilane because of their easy availability. Typically, silane (a) is present in an amount from 2.5 to 85 mole parts per 100 mole parts total of silane (a), silane (b) and silane (c) combined and preferably 30 to 60 mole parts on the same basis. Silane (b) is a silane or a mixture of silanes of the formula R2SiX3, where R2 is independently selected from the group consisting of monovalent organic groups having 6 to 30 carbon atoms and substituted monovalent organic groups having 6 to 30 carbon atoms as described above. X is independently a hydrolyzable group or a hydroxy group as described above. It is preferred that silane (b) be R SiCl , R2Si(OMe)3 and R Si(OEt)3 where Me stands for methyl and Et stands for ethyl because of their easy availability. Typically, silane (b) is present in an amount from 2.5 to 50 mole parts per 100 mole parts total of silane (a), silane (b) and silane (c) combined and preferably 10 to 25 mole parts on the same basis. R3 is independently selected from the group consisting of branched alkyl groups having 3 to 30 carbon atoms and substituted branched alkyl groups having 3 to 30 carbon atoms as described above, c is from 1 to 3, and X is independently a hydrolyzable group or a hydroxy group as described above. It is preferred that silane (c) be di-t-butoxydichlorosilane, di-t- butoxydihydroxysilane, di-t-butoxydimethoxysilane, di-t-butoxydiethoxysilane, and di-t- butoxydiacetoxysilane because of their easy availability. Typically, silane (c) is present in an amount from 5 to 95 mole parts per 100 mole parts total of silane (a), silane (b) and silane (c) combined and preferably 20 to 50 mole parts on the same basis. Water is present in an amount to effect hydrolysis of the hydrolyzable group, X. Typically water is present in an amount of 0.5 to 2.0 moles of water per mole of X in silanes (a), (b) and (c) and more preferably 0.8 to 1.2 moles on the same basis. The reaction to effect formation of the siloxane resin can be carried out in the liquid state with or without a solvent. If a solvent is used, it can include any suitable organic solvent that does not contain functional groups which may participate in the reaction and is a solvent for silanes (a), (b) and (c). The solvent is exemplified by, but not limited to, saturated aliphatics such as n-pentane, hexane, n-heptane, isooctane and dodecane; cycloaliphatics such as cyclopentane and cyclohexane; aromatics such as benzene, toluene, xylene and mesitylene; cyclic ethers such as tetrahydrofuran (THF) and dioxane; ketones such as methylisobutyl ketone (MIBK); halogen substituted alkanes such as trichloroethane; halogenated aromatics such as bromobenzene and chlorobenzene; and alcohols such as methanol, ethanol, propanol, butanol. Additionally, the above solvents may be used in combination of two or more as co solvents. Preferred solvents are aromatic compounds and cyclic ethers, with toluene, mesitylene and tetrahydrofuran being most preferred. When a solvent is used, it is generally used within a range of 40 to 95 weight percent solvent based on the total weight of solvent and silanes (a), (b) and (c). More preferred is 70 to 90 weight percent solvent on the same basis. Combining components (a), (b), (c), (d) and optionally a solvent (if it is used) may be done in any order as long as there is contact between any hydrolyzable groups (X) and water, so that the reaction proceed to effect formation of the siloxane resin. Generally the silanes are dissolved in the solvent and then the water is added to the solution. Some reaction usually occurs when the above components are combined. To increase the rate and extent of reaction, however, various facilitating measures such as temperature control and/or agitation are utilized. The temperature at which the reaction is carried out is not critical as long as it does not cause significant gelation or cause curing of the siloxane resin product. Generally the temperature can be in a range of 20°C to 150°C, with a temperature of 20°C to 100°C being preferred. When X is an acyloxy group such as acetoxy, it is preferred to conduct the reaction at or below 50°C. The time to form the siloxane resin is dependent upon a number of factors such as, but not limited to, the specific silanes being used, the temperature and the mole ratio of Rl, R2 and R3 desired in the siloxane resin product of the reaction. Typically, the reaction time is from several minutes to several hours. To increase the molecular weight of the siloxane resin prepared and to improve the storage stability of the siloxane resin it is preferred to carry out a bodying step subsequent to or as part of the above reaction. By "bodying" it is meant that the reaction is carried out over several hours with heating from 40°C up to the reflux temperature of the solvent to effect the increase in weight average molecular weight. It is preferred that the reaction mixture be heated such that the siloxane resin after heating has a weight average molecular weight in the range of about 5,000 to 100,000. When X is an acyloxy group such as acetoxy, the corresponding acid such as acetic acid is produced as a by-product of the reaction. Since the presence of acetic acid may adversely affect the stability of the siloxane resin product, it is desirable that any acetic acid be neutralized. Neutralization of the by-product acetic acid may be effected by contacting the reaction mixture with a neutralizing agent or by removal via distillation. The distillation is generally accomplished by the addition of solvent such as toluene (if it is not already present) and removing the acetic acid under reduced pressure and heat (i.e. up to 50°C) as an azeotrope with the solvent. If a neutralizing agent is used, it must be sufficiently basic to neutralize any remaining acetic acid and yet insufficiently basic so that it does not catalyze rearrangement of the siloxane resin product. Examples of suitable bases include calcium carbonate, sodium carbonate, sodium bicarbonate, ammonium carbonate, ammonia, calcium oxide or calcium hydroxide. Neutralization may be accomplished by any suitable means such as stirring in a powdered neutralizing agent followed by filtration or by passing the reaction mixture and any additional solvent over or through a bed of particulate neutralizing agent of a size which does not impede flow. The bodying step described herein above, is generally carried out after neutralization and/or removal of the by-product acetic acid. When X is a halide group HX is formed as a by-product of the reaction. Since the presence of HX may adversely affect the stability of the siloxane resin product, it is desirable that the HX be neutralized or removed using methods known in the art for neutralization or removal. For example, when HC1 is produced as a by-product it may be removed by providing a gas sweep in the reaction vessel. Or the HC1 may be neutralized using the process described above. Or the HC1 may be removed by washing the siloxane resin solution with water until neutral. 3 X is a halide group) it is possible that all of the OR groups in silane (c) will be removed during the formation of the siloxane resin resulting in a siloxane resin composition comprising (A) and (B) siloxane units and additionally Siθ4/2 units. The siloxane resin may be recovered in solid form by removing the solvent if a solvent was used. The method of solvent removal is not critical and numerous approaches are well known in the art. For example, a process comprising removing the solvent by distillation under vacuum and heat (i.e. 50°C to 120°C) may be used. Alternatively, if it is desired to have the siloxane resin in a particular solvent, a solvent exchange may be done by adding a secondary solvent and distilling off the first solvent. Siloxane resins containing greater than 10 weight percent silicon bonded hydrogen (Si-H) are generally kept as solutions, while those with less Si-H may be stored in solid form. 90 moles percent of the alkyl containing R groups remain on the siloxane resin and greater than 70 mole percent of the hydrogen containing R groups remain on the siloxane resin. The porosity in the final insoluble porous resin can be controlled by the mole percent of R2 and R3O groups in the siloxane resin and how the siloxane resin is heated. The insoluble porous resins formed from siloxane resins containing both R2 and R3O groups incorporated into the siloxane resin generally result in an increase in porosity, typically about 10 volume percent, when compared with siloxane resins cured under similar conditions which contain only R2 or R3O groups incorporated into the siloxane resin of similar compositions (i.e. the mol % of total R2 or R3O leaving groups is approximately the same). R3O groups from the cured siloxane resin. Generally, it is preferred that the curing/removal step be conducted at a temperature in a range of greater than 350°C to 600°C, with a temperature in a range of 400°C to 550°C being most preferred. It is preferred that the heating takes place in an inert atmosphere, although other atmospheres may be used. Inert atmospheres useful herein include, but are not limited to, nitrogen, helium and argon with an oxygen level less than 50 parts per million and preferably less than 15 parts per million. Heating may also be conducted at any effective atmospheric pressure from vacuum to above atmospheric and under any effective oxidizing or non- oxidizing gaseous environment such as those comprising air, O2, oxygen plasma, ozone, ammonia, amines, moisture, N2O, hydrogen, etc. (C) further heating the coated substrate to a temperature sufficient to effect removal of the R2 and R3O groups from the cured coating composition, thereby forming an insoluble porous coating on the substrate. It is preferred that the siloxane resin contains an average of 30 to 60 mole parts (a), 10 to 25 mole parts (b) and 20 to 50 mole (c) per 100 mole parts total amount of (a), (b) and (c) and the sum of (a), (b) and (c) is at least 70 percent of total siloxane units in the resin composition. The siloxane resin is typically applied to a substrate as a solvent dispersion. Solvents which may be used include any agent or mixture of agents which will dissolve or disperse the siloxane resin to form a homogeneous liquid mixture without affecting the resulting coating or the substrate. The solvent can generally be any organic solvent that does not contain functional groups which may participate in a reaction with the siloxane resin, such as hydroxyl, exemplified by those discussed herein above for the reaction of the silane mixture with water. 600°C, with a temperature in a range of 400°C to 550°C being most preferred. During the curing and heating step, greater than 90 mole percent of alkyl containing R! groups remain on the siloxane resin and greater than 70 mole percent of hydrogen containing R! groups remain on the siloxane resin. In the single-step process the curing of the siloxane resin and removal of the R2 and O groups are effected simultaneously by heating at a temperature within a range of greater than 20°C up to the lesser of the decomposition of the siloxane resin backbone or the R! groups bonded to silicon atoms described herein above to effect removal of the R2 and R3O groups from the cured coating composition. Generally, it is preferred that the curing/removal step be conducted at a temperature in a range of greater than 350°C to 600°C, with a temperature in a range of 400°C to 550°C being most preferred. The porosity in the final insoluble porous resin can be controlled by the mole percent of R2 and R3O groups in the siloxane resin and how the siloxane resin is heated. It is preferred that the heating be conducted in an inert atmosphere, although other atmospheres may be used. Inert atmospheres useful herein include, but are not limited to, nitrogen, helium and argon with an oxygen level less than 50 parts per million and preferably less than 15 parts per million. Heating may also be conducted at any effective atmospheric pressure from vacuum to above atmospheric and under any effective oxidizing or non- oxidizing gaseous environment such as those comprising air, O2, oxygen plasma, ozone, ammonia, amines, moisture, N2O, hydrogen, etc. By the above method a thin (less than 5 μm) insoluble porous coating is produced on the substrate. Preferably the insoluble porous coatings have a thickness of 0.3 to 2.5 μm and a thickness of 0.5 to 1.2 μm being more preferable. The coating smoothes the irregular surfaces of the various substrates and has excellent adhesion properties. Any method of heating such as the use of a quartz tube furnace, a convection oven, or radiant or microwave energy is generally functional herein. Similarly, the rate of heating is generally not a critical factor, but it is most practical and preferred to heat the coated substrate as rapidly as possible. The insoluble porous coatings produced herein may be produced on any substrate. However, the coatings are particularly useful on electronic substrates. By "electronic substrate" it is meant to include silicon based devices and gallium arsenide based devices intended for use in the manufacture of a semiconductor component including focal plane arrays, optoelectronic devices, photovoltaic cells, optical devices, transistor-like devices, 3-D devices, silicon-on-insulator devices, super lattice devices and the like. Additional coatings may be applied over the insoluble porous coating if desired. These can include, for example SiO coatings, silicon containing coatings, silicon carbon containing coatings, silicon nitrogen containing coatings, silicon oxygen nitrogen containing coatings, silicon nitrogen carbon containing coatings and/or diamond like coatings produced from deposition (i.e. CVD, PECVD, etc.) of amorphous SiC:H, diamond, silicon nitride. Methods for the application of such coatings are known in the art. The method of applying an additional coating is not critical, and such coatings are typically applied by chemical vapor deposition techniques such as thermal chemical vapor deposition (TCVD), photochemical vapor deposition, plasma enhanced chemical vapor deposition (PECVD), electron cyclotron resonance (ECR), and jet vapor deposition. The additional coatings can also be applied by physical vapor deposition techniques such as sputtering or electron beam evaporation. These processes involve either the addition of energy in the form of heat or plasma to a vaporized species to cause the desired reaction, or they focus energy on a solid sample of the material to cause its deposition. The insoluble porous coatings formed by this method are particularly useful as coatings on electronic devices such is integrated circuits. The dielectric constant of the insoluble porous coatings made by this method range from 1.5 to 3, with a range from 1.5 to 2.5 being more preferred for interlayer dielectric coatings. By the term "porous" it is meant an insoluble porous coating having a porosity of 1 to 60 volume percent. Porosity in the range of 10 to 60 volume percent is preferred. The modulus of the insoluble porous coatings ranges from 1.0 to 10 GPa. EXAMPLES  The following non-limiting examples are provided so that one skilled in the art may more readily understand the invention. In the Examples weights are expressed as grams (g). Molecular weight is reported as weight average molecular weight (Mw) and number average molecular weight (Mn) determined by Gel Permeation Chromatography. Analysis of the siloxane resin composition was done using 2^Si nuclear magnetic resonance (NMR). Nitrogen adsorption porosimetry measurements were performed using a QuantaChrome Autosorb 1 MP system. The cured siloxane resins were ground into fine powders before being placed into the sample cell, degassed for several hours, and loaded into the analysis station. The surface area was determined by the Brunauer-Emmett-Teller method. The total pore volume was determined from the amount of vapor adsorbed into the pores at a relative pressure close to unity (P/Po = 0.995) with the assumption that the pores filled with adsorbate. Skeletal density was measured using a helium gas pycnometer. Skeletal density represents the true density of the siloxane resin solid structure without including any interior voids, cracks or pores in the measurement. The percent porosity was calculated from the skeletal density and the total pore volume. Refractive Index (RI) and coating thickness were measured using a Woollam M-88 Spectroscopic Ellipsometer. In the following examples Me stands for methyl and tBu stands for tertiary-butyl, AcO stands for acetoxy, and Et stands for ethyl. In the following tables, n.m. indicates the specified property was not measured. Example 1. This example illustrates the formation of siloxane resin compositions where RI is hydrogen, R2 is an organic group having 8 to 22 carbon atoms and R3 is a t-butyl group. HSi(OEt) (A), (AcO)2Si(OtBu)2 (B) and R2Si(OMe)3 (C) were added to 75 g of tetrahydrofuran (THF) in a flask under an argon atmosphere in the amounts described in Table 1. Deionized water (D) was then added to the flask and the mixture was stirred at room temperature for 1 hour. Then 75 g of toluene was added to the mixture. The solvent was removed using a rotary evaporator to yield a siloxane resin as a viscous oil, which was immediately dissolved into 150 g of toluene. The by-product acetic acid was removed as an azeotrope with toluene by heating to 38°C under reduced pressure. The resin was again dissolved into toluene and azeotropically dried and heated in refluxing toluene for lh. The R2Si(OMe)3 (C) is listed in Table 2. 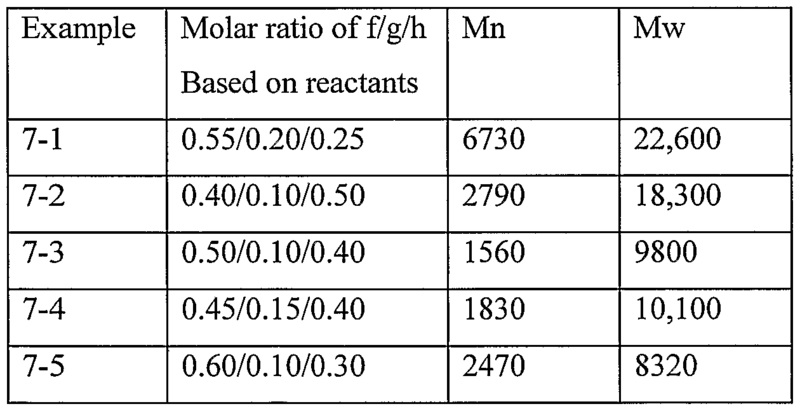 Analysis of the resin structure and molecular weight is shown in Table 3. AICI3 under a nitrogen atmosphere in a flask covered by aluminum foil to protect the reaction from UV/light. The mixture was stirred at room temperature for 17 days under the nitrogen atmosphere while continuing the UV/light protection. Unreacted chlorosilanes were distilled from the reaction mixture under vacuum and trapped in a Schlenk tube immersed in liquid nitrogen. The remaining product was distilled at 760 mm Hg to give several fractions characterized by 2^Si NMR and included the following fractions enriched in Cl2Si(OMe)2: Fraction 1 (b.p. 95°C, 70 m Hg) 87.0 g containing 44.0 weight % Cl3Si(OMe), 43.2 weight % Cl Si(OMe)2 and 12.8 weight % ClSi(OMe)3. 58.7 weight % Cl2Si(OMe)2 and 32.8 weight % ClSi(OMe)3. Example 2b. % (MeO)3Si(OtBu) and 5.9 weight % (MeO) Si(OtBu)3_ Example 2c. CH3Siθ3/2)o.55(CH3(CH2)i7Siθ3/2)o.24((tBuO)bSiθ4.b/2)θ.21 with Mn of 3030 and Mw of 4410. ZC6H4CH2CH2Si(OEt)3 (C) were added to 37 g of tetrahydrofuran (THF) in a flask under an argon atmosphere in the amounts described in Table 4. Deionized water (D) was then added to the solution and the mixture was stirred at room temperature overnight. 50 g of toluene was added to the reaction mixture. The solvent was removed using a rotary evaporator at 35 to 40°C to yield a viscous liquid, which was immediately dissolved into 80 g of toluene. Residual acetic acid was removed as an azeotrope with toluene (azeotrope boiling point at 38°C). The viscous liquid was added to 120 g toluene, 10 weight % as viscous liquid (based on total weight of toluene and viscous liquid), which was heated under reflux for 30 minutes and azeotropically dried and refluxed for lh. The solution was filtered and the solvent removed by evaporation to yield the final resin product. A summary of the resin synthesis is shown in Table 4. Analysis of the resin is shown in Table 5. Table 5. Analysis of (HSiO3/2)f(ZC6H4CH2CH2)SiO3/2)g((tBuO)b SiO4_b/2)h Resins. This example illustrates the formation of insoluble porous resins where R! is hydrogen, R2 is an organic group having 8 to 22 carbon atoms and R3 is a t-butyl group. Resins prepared in Example 1 and Example 2 (2 to 3 grams) were weighed into an alumina crucible and transferred into a quartz tube furnace. The furnace was evacuated to <20 mmHg (<2666 Pa) and backfilled with argon. The samples were heated to the temperatures shown in Table 6 at a rate of 50°C to 60°C/minute and held at temperature for 2 hours before cooling to room temperature while under an argon purge. The cured materials obtained were transparent or slightly opaque thick films Pyrolysis conditions, char yields, TGA (Thermogravimetric Analysis) yields and porosity data by nitrogen absorption measurements are shown in Tables 6 and 7. Char Yield and TGA Yield are expressed as weight % retained after analysis at a specified temperature. This example illustrates the formation of insoluble porous coatings on a substrate where R! is hydrogen, R2 is an organic group having 8 to 22 carbon atoms and R3 is a t- butyl group. Resins prepared in Examples 1,2 and 3 (2 to 3g) were dissolved in MIBK to form a clear solution containing 25 weight % as resin. The solution was filtered through a 1.0 μm syringe membrane filter, then a 0.2 μm syringe membrane filter to remove any large particles. The solution was applied to a silicon wafer by spin coating at 2000 rpm for 20 seconds. The coated silicon wafers were put into a quartz tube furnace and the furnace was purged with nitrogen. The furnace was quickly heated to 450°C (50°C to 60°C /minute) and held at 450°C for 2 hours, then cooled to room temperature while maintaining the nitrogen purge. The coated wafers were stored under a nitrogen atmosphere before the property measurements. Properties of the thin films are shown in Table 8. Table 8. Thin film Properties of resins on silicon wafers, 450°C. This example illustrates the formation of insoluble porous coatings on a substrate where Rl is hydrogen, R2 is an organic group having 8 to 22 carbon atoms, and R3 is a t- butyl group under various cure temperatures. Resins prepared in Example 1 (2 to 3g) were dissolved in MIBK to form a clear solution containing 25 weight % as resin. The solution was filtered through a 1.0 μm syringe memberane filter, followed by a 0.2 μm syringe membrane filter to remove any large particles. The solution was applied to a silicon wafer by spin coating at 2000 rpm for 20 seconds. The coated silicon wafers were put into a quartz tube furnace and the furnace was purged with nitrogen. The furnace was heated 250, 390 and 450°C and held at each temperature for 1 hour, respectively, then cooled to room temperature while maintaining the nitrogen purge. The coated wafers were stored under a nitrogen atmosphere before the property measurements. Properties of the thin films are shown in Table 9. Table 9. 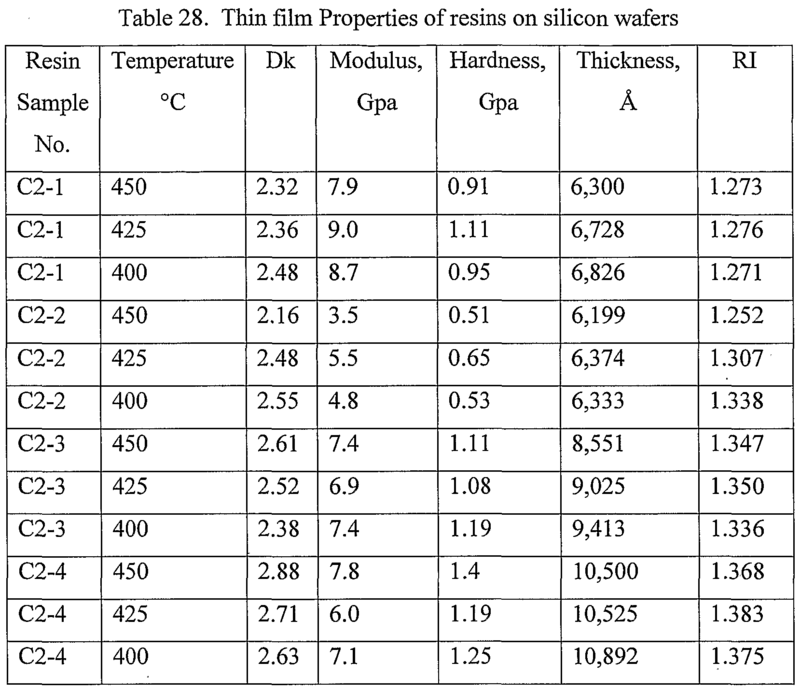 Thin film Properties of resins on silicon wafers. This example illustrates the formation of siloxane resin compositions where Rl is methyl, R2 is octadecyl and R3 is a t-butyl group. MeSi(OMe)3 (A), (AcO)2Si(OtBu)2 (B) and CH3(CH2)i7Si(OMe)3 (C) were added to 75 g of THF in a flask under an argon atmosphere in the amounts described in Table 9. Deionized water (D) was then added to the solution and the mixture was stirred at room temperature for 1 hour. 75 g of toluene was added to the reaction mixture. The solvent was removed via evaporation using a rotary evaporator to yield the product as viscous oil, which was immediately dissolved into 150 g of toluene. Residual acetic acid was removed as an azeotrope with toluene under reduced pressure by heating to 38°C. The resin was again dissolved into 250 g of toluene and azeotropically dried and refluxed for lh. The solution was filtered and the solvent removed by evaporation to yield the final resin product. 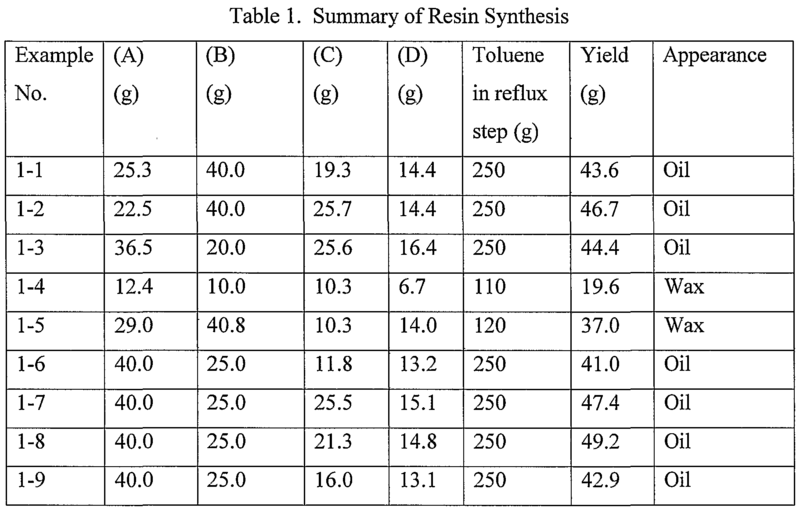 A summary on the resin synthesis is shown in Table 10. The molecular weight information for the resins is shown in Table 11. Analysis of (MeSiO3 2)f (CH3(CH2)i7SiO3/2)g((tBuO)bSiO4_b/2)h Resins. This example illustrates the formation of insoluble porous resins where Rl is methyl, R2 is octadecyl and R3 is a t-butyl group. Resins prepared in Example 7 (2 to 3g) were weighed into an alumina crucible and transferred into a quartz tube furnace. The furnace was evacuated to <20 mmHg (<2666 Pa) and backfilled with argon. The samples were heated to the temperatures shown in Table 12 at a rate of 50°C to 60°C/minute and held at temperature for 2 hours before cooling to room temperature while under an argon purge. The cured materials obtained were transparent or slightly opaque thick. Pyrolysis conditions, char yields, TGA yields and porosity data by nitrogen absorption measurements are shown in Tables 12 and 13. Table 12. 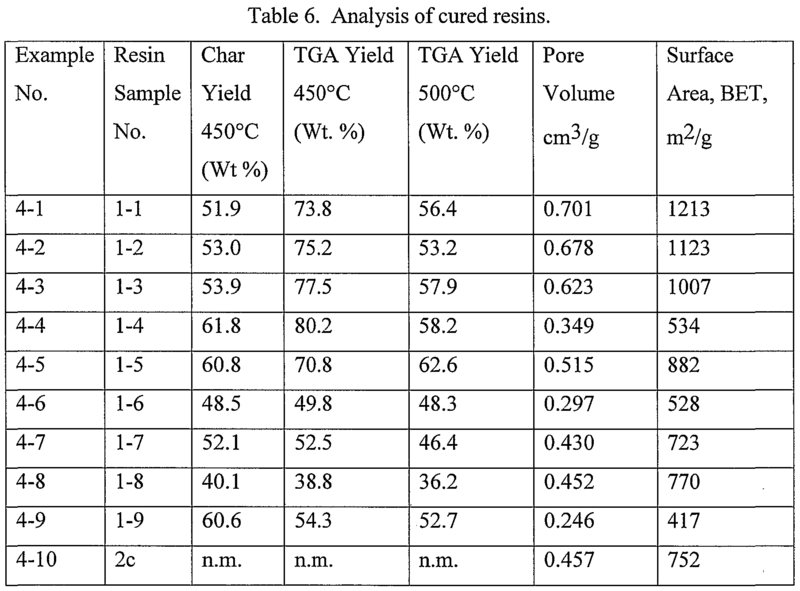 Porosity and char yields of cured resins. Example 9. This example illustrates the formation of insoluble porous coatings on a substrate where R* is methyl, R2 is octadecyl and R3 is a t-butyl group. Resins prepared in Example 7 (2 to 3g) were dissolved in MIBK to form a clear solution containing 25 weight % as resin. The solution was filtered through a 1.0 μm syringe membrane filter followed by a 0.2 μm syringe membrane filter to remove any large particles. The solution was applied to a silicon wafer by spin coating at 2000 rpm for 20 seconds. The coated silicon wafers were put into a quartz tube furnace and the furnace was purged with nitrogen. The furnace was quickly heated to 450°C (50°C to 60°C/minute) and held at 450°C for 2 hours, then cooled to room temperature while maintaining the nitrogen purge. The coated wafers were stored under a nitrogen atmosphere before the property measurements. Modulus and dielectric constants (Dk) of the thin films are shown in Table 14. Table 14. Thin film Properties of resins on silicon wafers, 450°C. In a typical procedure, a mixture of Cl2Si(OtBu)2, RSiCl3 and HSiCl3 were dissolved into 40 ml of MIBK and added dropwise into a mixture consiting of 80 ml MIBK, and 60 ml of 0.5M HCl water in a 500 ml flask at 0°C under nitrogen. The reaction mixture then mixed at 25°C for overnight. The water and insoluble materials were removed and the organic phase dried using a dean stark trap. The solvent was evaporated using a ratovap and 4.0 g of white solid was obtained. A summary on the resin synthesis is shown in Table 17. The molecular weigh information and composition are in Table 18. An aliquot of resin samples prepared in example 11 were weighed into an alumina crucible and transferred into a tube furnace. The furnace was then evacuated to <20 torr and backfilled with argon. Under a purge of argon, the sample was heated to a designated temperature at 10°C/minute and held at temperature for 2 hours before cooling to room temperature. The final cured materials were obtained as transparent or slightly opaque thick free standing films. 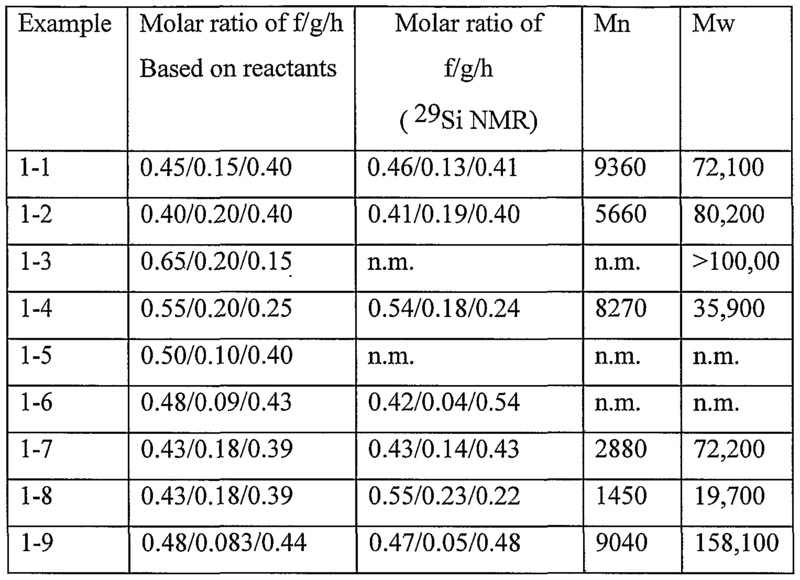 The pyrolysis conditions, char yields and porosity information by nitrogen absorption measurements are given in Table 19. Table 19. Porosity and char yields for resins pyrolyzed at 450°C. An aliquot of resins prepared in example 11 were dissolved in methylisobutyl ketone (MIBK) to form a 25 wt.% clear solution. The solution was sequentially filtered through a 1.0 μm and a 0.2 μm syringe membrane filters to remove any large particles. The solution was applied to the silicon wafer and spin coated on silicon wafer using either a Karl Suss RC8 or a Headway spin coater and spun at 2000 rpm for 20 seconds. The thickness of the as-spun films can be controlled by a combination of solution concentration and spin speed, ranging from 2000 to 20,000 angstroms. H T aT bQc resins are shown in table 20. (B) were added to 72 g of tetrahydrofuran (THF) in a flask under an argon atmosphere in the amounts described in Table 13. Deionized water (D) was then added to the flask and the mixture was stirred at room temperature for 1 hour. Then 75 g of toluene was added to the mixture. The solvent was removed via evaporation using a rotary evaporator to yield a siloxane resin as a viscous oil, which was immediately dissolved into 150 g of toluene. Byproduct acetic acid was removed as an azeotrope with toluene by heating to 38°C under reduced pressure. The resin was again dissolved into 110 g of toluene and azeotropically dried and heated in refluxing toluene for lh. The solution was filtered and the solvent removed by evaporation to yield the siloxane resin product. A summary of the resin synthesis is shown in Table 21. The molecular weight information for the resins is shown in Table 22. Table 22. Analysis of (HSiθ3 /2)f (tBuO)bSiO4_b/2)h Resins. Samples of the resins (2 to 3 g) were weighed into an alumina crucible and transferred into a quartz tube furnace. The furnace was evacuated to <20 mmHg (<2666 Pa) and backfilled with argon. The samples were heated to 450°C at a rate of 50°C to 60°C/minute and held at 450°C for 1 hour before cooling to room temperature while under an argon purge. The cured siloxane resins were obtained as transparent or slightly opaque thick films. The pyrolysis temperature, Char Yield and porosity data are shown in Table 23. Char Yield is expressed as weight percent retained after analysis at the specified temperature. Table 23. Porosity and char yields of cured resins. Samples of the resins (2 to 3g) were dissolved in MIBK to form a clear solution containing 25 weight % as resin. The solution was filtered through a 1.0 μm syringe membrane filter followed by a 0.2 μm syringe membrane filter to remove any large particles. The solution was applied to a silicon wafer by spin coating at 2000 rpm for 20 seconds. The coated silicon wafers were put into a quartz tube furnace and the furnace was purged with nitrogen. The furnace was heated to 450°C (50°C to 60°C/minute) and held at temperature for 2 hours, then cooled to room temperature while maintaining the nitrogen purge. The coated wafers were stored under a nitrogen atmosphere before the property measurements. 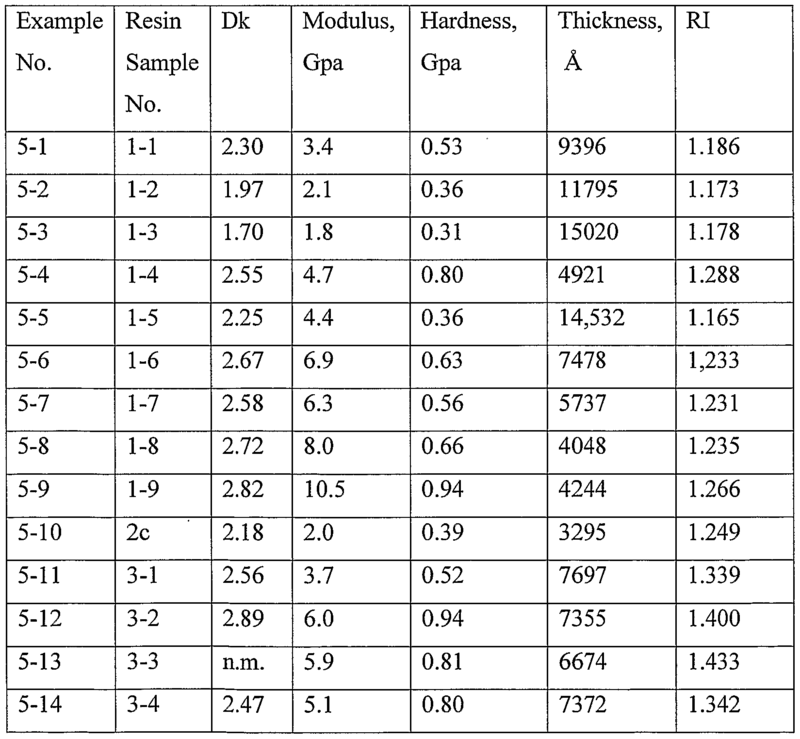 Modulus and dielectric constants (Dk) of the thin films are shown in Table 24. This example illustrates that siloxane resins where Rl is hydrogen, R2 is not present and R3 is a t-butyl group result in very good modulus but unacceptably high Dk when compared with Examples 1 and 2. This example also shows that porosity is lower when compared to Examples 1 and 2 which contain both R2 and R3 groups. Comparative Example 2. This example illustrates the formation of siloxane resin compositions where R is methyl, R2 is not present and R3 is a t-butyl group. MeSi(OMe)3 (A), (AcO)2Si(OtBu)2 (B) and THF were added to a flask under an argon atmosphere in the amounts described in Table 17. AcO stands for acetoxy, Me stands for methyl and tBu stands for tertiary-butyl. Deionized water was then added to the flask and the mixture was stirred at room temperature for 1 hour. 75 g of toluene was added to the reaction mixture. The solvent was removed via evaporation using a rotary evaporator to yield the product as viscous oil, which was immediately dissolved into 150 g of toluene. Residual acetic acid was removed as an azeotrope with toluene under reduced pressure (azeotrope boiling point at 38°C). The resin was again dissolved into 110 g of toluene and azeotropically dried and refluxed for lh. The solution was filtered and the solvent removed by evaporation to yield the final resin product. A summary of the resin synthesis is shown in Table 25. 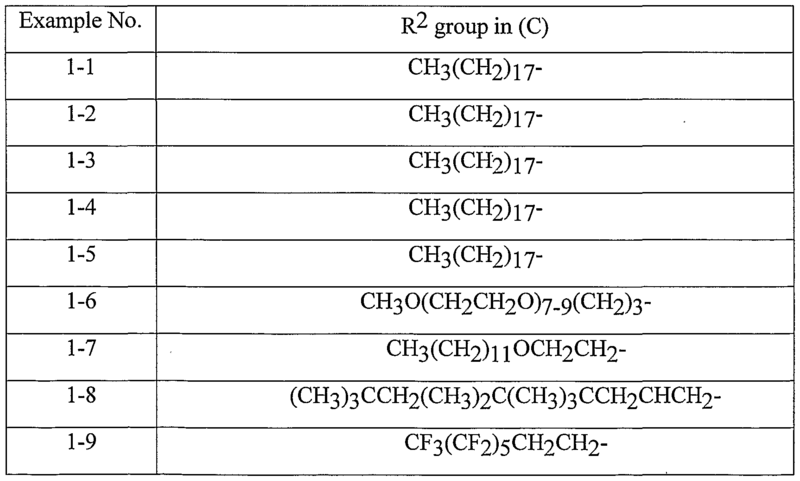 The molecular weight information for the resins is shown in Table 26. Table 26. Analysis of (MeSiθ3/2)f((tBuO)bSiθ4_b/2)h Resins. Samples of the resins (2 to 3 g) were weighed into an alumina crucible and transferred into a quartz tube furnace. The furnace was evacuated to <20 mmHg (<2666 Pa) and backfilled with argon. The samples were heated to 450°C at a rate of 10°C/minute and held at 450°C for 1 hour before cooling to room temperature while under an argon purge. The cured siloxane resins were obtained as transparent or slightly opaque thick films. The pyrolysis temperature, Char Yield and porosity data are shown in Table 27. Char Yield is expressed as weight percent retained after analysis at the specified temperature. Table 27. 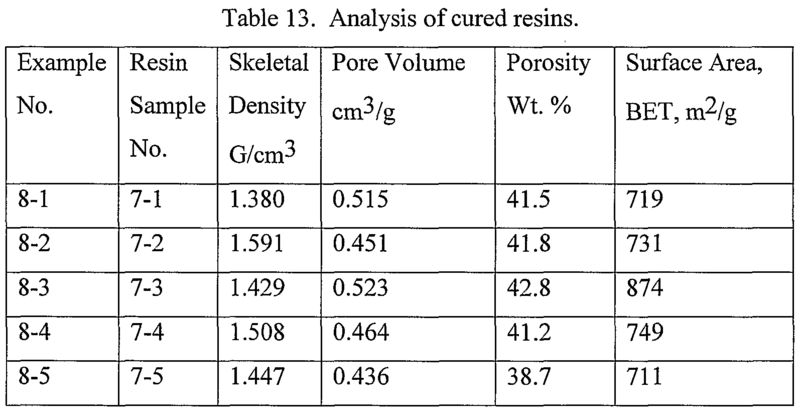 Porosity and char yields of cured resins. Samples of the resins (2 to 3g) were dissolved in MIBK to form a clear solution containing 25 weight % as resin. The solution was filtered through a 1.0 μm syringe membrane filter followed by a 0.2 μm syringe membrane filter to remove any large particles. The solution was applied to a silicon wafer by spin coating at 2000 rpm for 20 seconds. The coated silicon wafers were put into a quartz tube furnace and the furnace was purged with nitrogen. The furnace was heated to the temperature indicated in Table 21 (50° to 60°C/minute) and held at temperature for 2 hours, then cooled to room temperature while maintaining the nitrogen purge. The coated wafers were stored under a nitrogen atmosphere before the property measurements. Modulus and dielectric constants (Dk) of the thin films are shown in Table 28. This example illustrates that siloxane resins where R is methyl, R2 is not present and R3 is a t-butyl group result in good Dk but porosity is lower when compared to Example 7 which contains both R2 and R3 groups. 110°C in the presence of 1.2 X 10"5 weight parts of platinum in the form of a complex with l,3-diethenyl-l,l,3,3-tetramethyldisiloxane for 2 hours. A 2 g sample of each resin solution after reaction was placed into a ceramic crucible, heated at 350°C in nitrogen for 0.5 hour, and then heated at 500°C in nitrogen for 1 hour. A sample of each resin solution was diluted with toluene to 17 weight % and applied to a silicon wafer by spin coating and cured as described in Example 5 and dielectric constant was measured. Table 29 shows the weight parts of solvent and 1-octadecene used per 1 weight part of hydrogen silsesquioxane resin, porosity and dielectric constant for each sample. Sample C3-3 is the hydrogen silsesquioxane resin solution in toluene which was not reacted with 1-octadecene. This example illustrates that siloxane resins where Rl is hydrogen, R2 is octadecyl and R3 is not present result in good Dk but porosity is lower when compared to Examples 1 and 2 which contains both R2 and R3O groups. (C) 5 to 95 mole parts of (R3O)bSiO(4_b)/2 siloxane units, wherein R3 is independently selected from the group consisting of branched alkyl groups having 3 to 30 carbon atoms and branched substituted alkyl groups having 3 to 30 carbon atoms, b is from 1 to 3, components (A), (B) and (C) combined total 100 mole parts and the sum of components (A), (B) and (C) total at least 50 percent of the siloxane units in the resin composition. 2. The siloxane resin composition as claimed in claim 1, wherein the siloxane resin contains an average of 30 to 60 mole parts component (A), 10 to 25 mole parts component (B) and 20 to 50 mole parts (C) and where components (A), (B) and (C) total 100 mole parts and the sum of (A), (B) and (C) is at least 70 percent of the total siloxane units in the resin composition. 3. The siloxane resin composition as claimed in claim 1, wherein Rl is selected from the group consisting of methyl, hydrogen and mixtures thereof, R2 is an unsubstituted or substituted alkyl group having 10 to 20 carbon atoms and R3 is a tertiary alkyl having 4 to 18 carbon atoms. 4. The siloxane resin composition as claimed in claim 1, wherein R3 is t-butyl. Si(X)d (OR3)f O(4_d-f/2)> Siθ4/2 and mixtures thereon in which Rl, R2, and R3 are defined above; each X is independently a hydrolyzable group or a hydroxy group, and d and f are from 1 to 2. 7. The method as claimed in claim 6, further comprising a solvent. 8. The method as claimed in claim 6, wherein Rl is selected from the group consisting of methyl, hydrogen and mixtures thereof, R2 is an unsubstituted or substituted alkyl group having 10 to 20 carbon atoms and R3 is a tertiary alkyl having 4 to 18 carbon atoms. 9. The method as claimed in claim 6, wherein R3 is t-butyl. 10. The method as claimed as in claim 6, wherein the water is present in a range from 0.5 to 2.0 moles of water per mole of X in silane (a), silane (b) and silane (c). 11. The method as claimed as in claim 6, wherein the water is present in a range from 0.8 to 1.8 moles of water per mole of X in silane (a), silane (b) and silane (c). 12. The method as claimed in claim 6 wherein X is a chlorine atom. 13. The product produced by the method of claim 12. (B) further heating the siloxane resin for a time and temperature sufficient to effect removal of the R2 and R3O groups from the cured siloxane resin, thereby forming an insoluble porous resin. 15. The method as claimed in claim 12, where the heating in step (A) is from greater than 20°C to 350°C and the further heating in step (B) is from greater than 350°C to 600°C. 16. The method as claimed in claim 12, where the curing of the siloxane resin and removal of the R3O groups from the cured siloxane resin is done in a single step. 17. The method as claimed in claim 12, wherein the insoluble porous resin has a porosity from 1 to 60 volume percent and a modulus from 1.0 to 10 GPa. (C) further heating the coated substrate to a temperature sufficient to effect removal of the R2 and R3O groups from the cured coating composition, thereby forming an insoluble porous coating on the substrate. 19. The method as claimed in claim 18, where the heating in step (B) is from greater than 20° to 350°C and the further heating in step (C) is from greater than 350° to 600°C. 20. The method as claimed in claim 18, where the curing and removal of the R2 and R3O groups is done in a single step at a temperature within a range of greater than 20°C to 600°C. 21. The method as claimed in claim 18, where the removal of the R2 and R O groups is done at a temperature within a range of greater than 350°C to 600°C. 22. The method as claimed in claim 18, wherein the insoluble porous coating has a porosity of 1 to 60 volume percent, a dielectric constant in the range of 1.5 to 3.0 and a modulus in the range of 1.0 to 10 GPa. 23. An electronic substrate having an insoluble porous coating prepared by the method of claim 18. (C) further heating the coated substrate to a temperature to effect removal of any R2 groups from the cured coating composition, thereby forming an insoluble porous coating on the substrate. 25. The method as claimed in claim 24 wherein the curing and removal steps are done in a single step at a temperature within the range of greater than 20°C t 600°C. 26. An electronic substrate having an insoluble porous coating prepared by the method of claim 24.